Abacca - Is 100% naturally obtained from Philippine Banana plants (mainly found in the Visayas), where there are rain forests and highly humid atmospheric conditions. Fibers are removed and stripped then spun into rough of threads from the banana stalk. Most popular fine-weave fiber which are commonly used in making hats, twines, ropes, bags, clothing, baskets, boxes, ribbons, table placemats, runners, ribbons, braids, wrappers, paper-based materials and many more. The fibers became finer and whiter in color which is suitable for clothing and other related products. 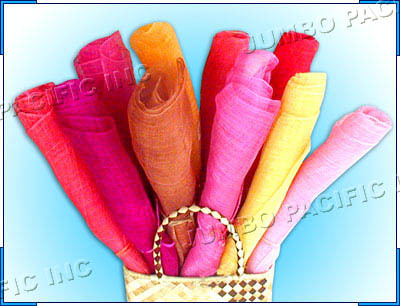 Then fibers are colored and purely hand woven into rolls of beautiful, natural and environment friendly cloth. Here is a close up look of sinamay fibers. Below are some sample colors of sinamay cloth/fibers. It may come in variety of colors as prefered by the need and requirement of customers.